A melanoma is a tumor produced by the malignant transformation of melanocytes. Melanocytes are derived from the neural crest; consequently, melanomas, although they usually occur on the skin, can arise in other locations where neural crest cells migrate, such as the gastrointestinal tract and brain. 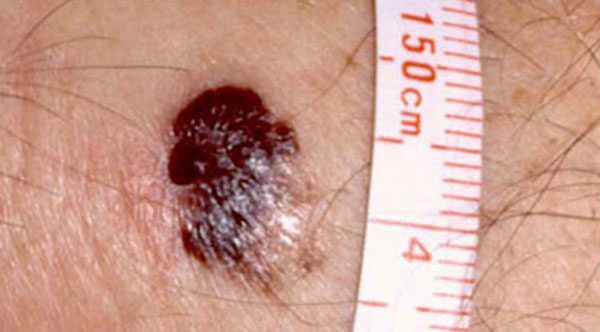 The 5-year relative survival rate for patients with stage 0 melanoma is 97%, compared with about 10% for those with stage IV disease. E: Evolving, the lesion changes over time. In addition, melanomas may itch, bleed, ulcerate, or develop satellites. Patients who present with metastatic disease or with primary sites other than the skin have signs and symptoms related to the affected organ system(s). Perform biopsy on all lesions suggestive of melanoma; sample the thickest part of the lesion. Maintain a low threshold to perform biopsy because the procedure is easy and safe. If the resection will not result in a disfiguring defect, excisional biopsy with a 2-mm skin margin and extension to the subcutaneous tissue is suggested for lesions less than 1.5 cm in diameter. Take care to leave scars in locations where re-excision is not difficult. If the lesion is large or located in an anatomic area where skin removal would cause disfigurement, an incisional biopsy may be performed. A full-thickness core punch biopsy in the most raised or irregular area is suggested, with the understanding that this area may not be the thickest area. Medical therapy is used as adjuvant treatment in advanced stages of unresectable or metastatic melanoma. Recent FDA approvals include trametinib (Mekinist), dabrafenib (Tafinlar), and vemurafenib (Zelboraf). Trametinib is a MEK inhibitor indicated for melanoma with BRAF V600E or V600K mutations. Dabrafenib is a BRAF protein kinase inhibitor indicated for melanoma with BRAF V600E mutation. Vemurafenib is an inhibitor of some mutated forms of BRAF serine-threonine kinase, including BRAF V600E. Surgical therapy for melanoma is based on the predicted risk of local recurrence and metastatic disease and the potential morbidity of the operation. If the lesion has not spread beyond the primary site, it is potentially curable. Most of these lesions are thin (< 1 mm or CL I or II). After making the diagnosis, widely excise the tumor or previous biopsy site. Use a 0.5- to 1-cm margin for melanomas in situ. No further therapy other than observation for nodal or recurrent disease is necessary. For a T1 lesion, 1-cm excision margins are adequate, but lesions greater than 1 mm require 2-cm margins. Studies demonstrate no improvement in recurrence or survival rates with larger margins of resection. Attempt primary closure and perform skin grafting or flap closure if necessary. For lesions with a depth greater than 1 mm, many authorities recommend sentinel lymph node biopsy at the time of wide local excision (see Stage II below). Perform a 2-cm surgical resection on stage II lesions. No recurrence or survival advantage is gained when 2-cm margins are compared with wider margins (4-6 cm), as has been confirmed in a 2011 European study. Smaller resection decreases the need for skin grafting and inpatient hospital stay. Perform a complete therapeutic lymphadenectomy on patients with suspected lymph node metastases based on physical examination findings. This consists of excision of all lymph nodes in the affected regional lymph node basin. Consider sentinel lymph node biopsy if no clinically positive nodes are present. With the use of blue dye, radioisotope, or both, injected at the site of the primary melanoma, the first-echelon node can be identified within the regional lymph node basin. Send this sentinel node to the pathologist for analysis using routine stains, immunohistochemistry, and even polymerase chain reaction in some centers. If the sentinel node is positive, then regional lymph node metastases is probable; importantly, perform a complete lymph node dissection. The correlation is based on the thickness of the primary tumor. If the sentinel lymph node is negative, the chance is 99% that all others are negative. This procedure is becoming the standard of care for tumors greater than 1 mm in depth. Hyperthermic arterial limb perfusion with melphalan for extremity melanomas has been studied as an adjuvant therapy. One study found it to be beneficial in that it produced higher response rates and overall survival rates than those for surgery alone. Other studies do not demonstrate benefit. Adjuvant chemotherapy and/or biological therapy are also undergoing clinical evaluation. One study demonstrated that high-dose interferon alfa-2b resulted in prolonged relapse-free survival and overall survival compared with no adjuvant therapy. A follow-up study by the same group demonstrated preliminary results indicating high-dose interferon achieved a relapse-free survival benefit over no adjuvant treatment but not over low-dose interferon. Neither high- nor low-dose interferon had a significant overall survival advantage compared with observation alone. High-dose interferon can be associated with significant toxic/adverse effects (ie, liver toxicity), and some patients require dose reduction because it may not be well tolerated. Wide local excision of the primary tumor with 2-cm margins remains first-line therapy. No survival advantage is demonstrated with wider resection margins. Skin grafting or other tissue-transfer techniques may be necessary to close the defect. Perform regional lymph node dissection because a stage III melanoma represents nodal disease. If the nodal status is unknown, consider a sentinel lymph node biopsy to determine if the disease is stage I, II, or III. As in stage II disease, the treatment failure rate is higher with wide local excision alone in this group compared with stages 0 and I. Many clinical trials currently are exploring similar options as adjuvant therapy. Advanced metastatic melanoma is usually refractory to standard therapy; thus, consider these patients for clinical trials. Some treatments have yielded various objective responses, although they are usually short-lived. Dacarbazine (DTIC) and the nitrosoureas, carmustine (BCNU) and lomustine (CCNU), produced a 20% objective response rate. Response rates for interferon alfa and interleukin 2 range from 8-22% and 10-20%, respectively. Recently, 2 studies have shown promising results. One study showed improved rates of overall and progression-free survival in patients with previously untreated metastatic melanoma with the BRAF V600E mutation who received vemurafenib versus standard dacarbazine. Another trial showed improved survival for metastatic melanoma patients treated with ipilimumab and dacarbazine versus placebo and dacarbazine. Another study looking at treatment of advanced extremity melanoma showed that hyperthermic isolated limb perfusion therapy is a more effective way of controlling this type of situation than isolated limb infusion therapy. Currently, other studies in progress are comparing other cytotoxic and biologic drug regimens. Surgical resection of isolated metastases in the gastrointestinal tract, the brain, the lungs, or bone may be performed for palliation, with occasional long survival. Metastatic lymph nodes also may be removed for palliation. Radiation may provide symptomatic relief for metastases to bone, the brain, or viscera. In-transit metastases arise in the lymphatics or soft tissue between the primary lesion and the regional lymph node basin at a rate of 2-3%. In addition to wide surgical excision as for a primary lesion, isolated hyperthermic limb perfusion is probably the most effective treatment for extremity lesions. Radiation and intralesional BCG vaccine injections have had varied success. Close follow-up care is essential to monitor for new primary lesions, recurrence, or metastases. History and physical examination are the cornerstones, with further testing (eg, chest radiography, blood chemistries) if suggestive findings are encountered. Most practitioners observe patients every 3-6 months initially and then eventually decrease the frequency, although no consensus exists. Physicians observe patients with thicker tumors more frequently than patients with thinner lesions. Follow-up care with a dermatologist is strongly recommended. Educate patients on self-examination for detection of new or recurrent lesions and for recognition of the signs and symptoms of metastatic disease because the risk of developing a second melanoma or having recurrence is well recognized.